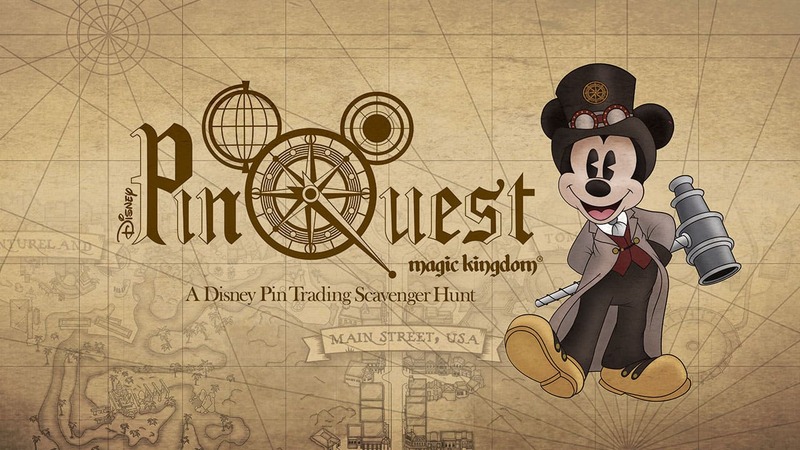 I’m excited to announce a new Disney pin trading scavenger hunt is coming to Magic Kingdom Park on June 30. Featuring Steampunk-inspired artwork, this Disney PinQuest reminds me of pin pursuits from the mid-2000s at Walt Disney World Resort. At that time, I was serving as Project Manager for Disney Pin Trading and the pursuits were a fun activity for guests of all ages. I recently caught up with Jeanne Lewis, merchandiser for Disney pins, to learn why this new PinQuest was created. The first step for this PinQuest is to purchase an adventure kit which contains a lanyard to showcase your pins; a decoder medal for use with PinQuest pins; and a lanyard pouch to hold the map included in the adventure kit. The lanyard pouch also holds PinQuest clue cards which are sold separately. Continue the hunt by using the decoder medal from the adventure kit. Line up the arrows for each pin to determine your next destination within Magic Kingdom Park. 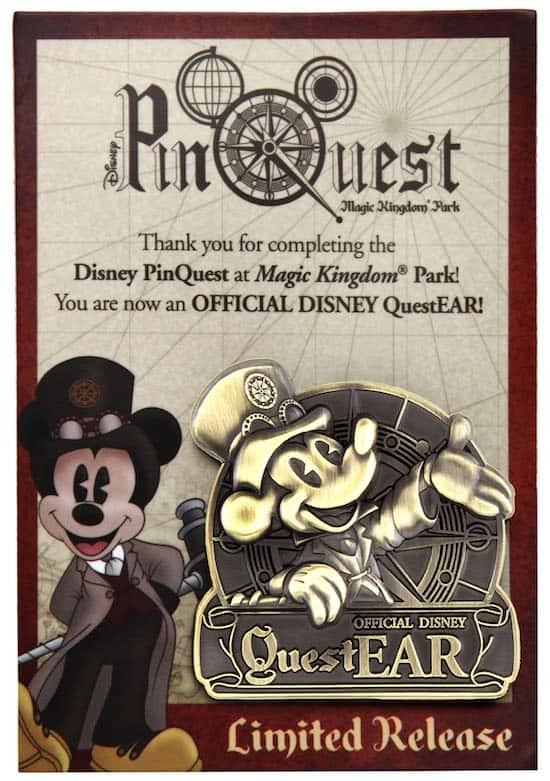 After purchasing all six clue cards and receiving stamps and pins from each location, guests should return to either Frontier Trading Post in Frontierland or Curtain Call Collectibles on Main Street, U.S.A. At those designated locations, guests who have completed the entire Magic Kingdom PinQuest are eligible to purchase a QuestEAR pin completer pin (shown above). All items for this PinQuest are available while supplies last. These items will not be sold online or via the Shop Disney Parks mobile app. You’ll need separate admission to Magic Kingdom Park in order to participate. Good luck and happy trading, QuestEARs! Is this only for June 30th or will it run for as long as there are supplies? We will be coming in August for three days and we love pin trading! This would be a fun family event! @Tim – The PinQuest was launched today. It was planned for this summer but, as you indicated, the PinQuest will continue while supplies last. Safe travels in August! How long will this be going for? @Jennifer – The PinQuest will continue through summer while supplies last. 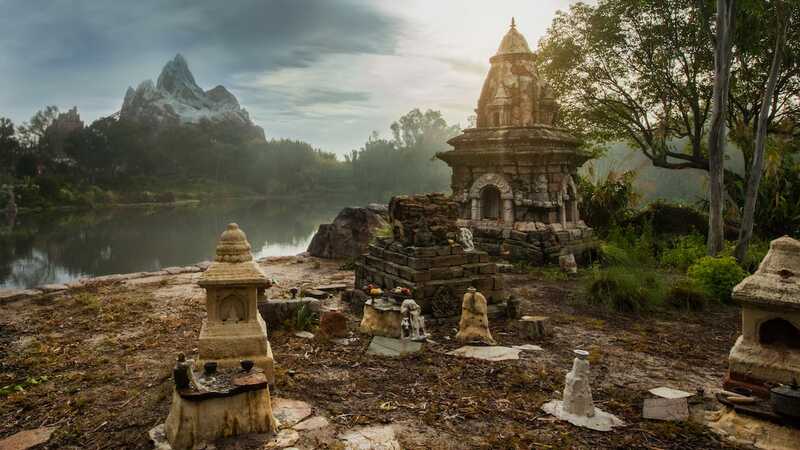 Will they have something similar at Disneyland? Can you start the quest on one day and finish it at a later time or do you need to complete it in one day? @Colleen – The Disney PinQuest can be completed in one day or it can be completed over multiple visits to Magic Kingdom. 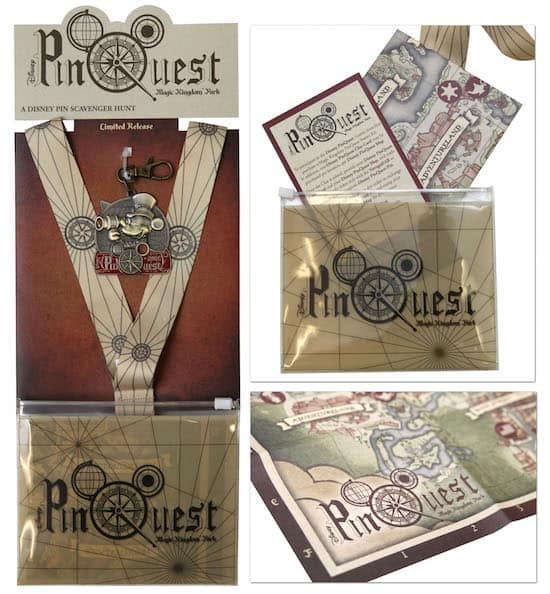 Disney PinQuest Adventure Kits, Clue Cards and Pins are limited and subject to availability. This is so exciting, and I can’t wait to participate! I’ve been waiting for a scavenger hunt like this. What are the prices like? Looks like fun! I wish they had more pins to commemorate things like dinning at a specific restaurant or dated pins for hotels. My husband and I collect pins that remind us of a specific trip and if we stay at the same hotel it would be nice to have dates. Aww 🙁 So it will probably be gone by the time we go in October. I’m not a huge pin collector, but I love the themes for this and scavenger hunts so it stinks that we’ll end up missing it. really hope this is still happening in Sept too…Love me some pin trading! I love those pins! I hope they decide to extend it instead of just being for summer. Given the rate at which new merchandise, especially something as cool-looking as this, literally flies off shelves at the Disney parks, I predict the supplies will be completely gone by the end of the 4th of July holiday weekend. @Paul – This Disney PinQuest was designed to run through summer. Highly doubtful they will all be gone by July 4th. I hope you have an opportunity to visit soon. – Curtain Call Collectibles, Main Street, U.S.A.
Darn! We just got back from Walt Disney World! This would have been so much fun for my family! I hope they continue to do this. We are already talking about making another trip! is this only in Florida or will it also be happening in California? We are going to Disneyland this weekend to celebrate….would love to participate in this fun game as well. I’m also hoping this lasts until September. We’d love to do this when we get there. This looks so fun! Thank you for doing more activities with pins! Please do more Pin Trading Nights! Wish they would do special stuff like this during the fall. I feel like they only do this stuff in summer. Looks super fun!! You mention that it’s Summer only, is there an end date in mind? @Stephen – The length of time will depend upon popularity with guests. The Disney PinQuest was planned for summer 2016. All items are available while supplies last. So it sounds like it will cost a total of $80? That seems pricey. Do wish they extended this out through the food and wine fest. end. I would love to purchase this and have it waiting in our room when we arrive as a surprise for my daughter. Is this an option? @Laurie – Unfortunately, these items are only being sold in select merchandise locations at Magic Kingdom Park. I’m sorry I don’t have better news for you. I hope, however, that you have a nice visit. Looks awesome Steven! Any Hidden Mickey Pin news? @Michael – Nothing to report at this time. @Denean – You should be fine using your Annual Pass to access Magic Kingdom (provided there are not block out dates, etc). 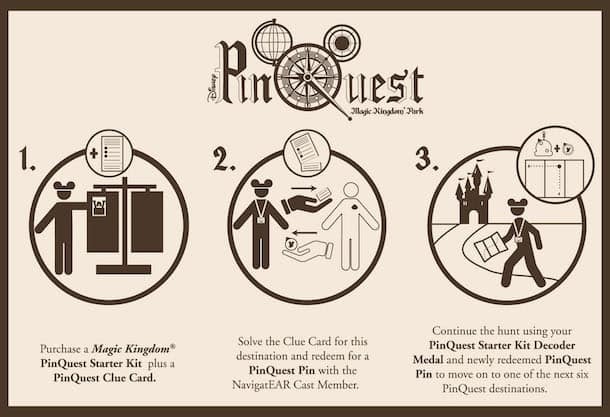 The statement “You’ll need separate admission to Magic Kingdom Park in order to participate” was included as the Disney PinQuest is being offered in a location that requires ticketed admission. What is Disney’s definition of “Summer”? @Meredith – The Disney PinQuest was planned for summer which means that inventory was designed to run through the summer months (into September). The availability of the inventory will depend upon how popular the activity is with guests. If many guests participate, then the Disney PinQuest may end earlier than planned. It could also run longer than the summer months. At this time, it’s difficult to estimate popularity as this is the first time we’ve offered this kind of PinQuest. My daughter and I were just reading this together (she will be 6 next month) and she is dying to do it when we visit. The only problem is that we aren’t coming until December… A baby on the way in the next few weeks makes it impossible to make it this summer. PLEASE either extend this one or have a new one for then!!! Our family would have so much fun with it!! We really enjoyed Remy’s Food & Wine Scavenger Hunt last year. This one sounds like it would be great problem solving work for my daughter and a fun family memory for us solving the mysteries together. Please, PLEASE, PLEASE?!?!?!?!? Sounds great, but add us to the list of folks wishing they’d do these kinds of pin events year round. We usually go in February (as we will be next year), and there’s never anything like this happening. @Steven – Nice name 🙂 Thank you for your feedback. This is the first Disney PinQuest of this nature. We have offered scavenger hunts during the Epcot International Flower & Garden Festival in the spring or Epcot International Food & Wine Festival in the fall. Since this is continuing while supplies last, does that mean it is a possibility that it could still be continuing in September, or will this definitely end during the summer? And if so, will there be a similar event happening in the fall months? 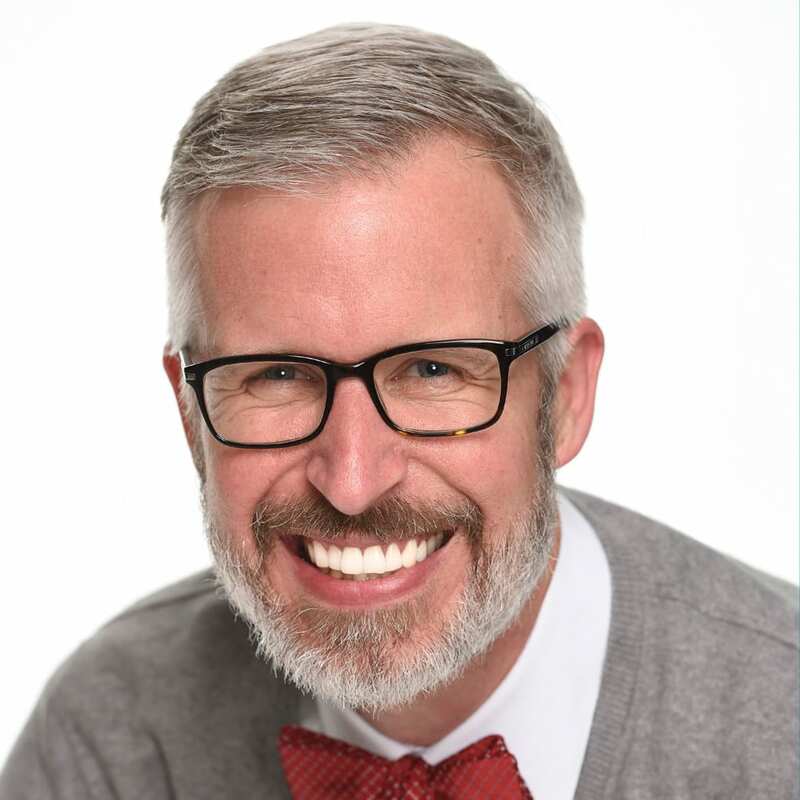 @Travis – Great question. The availability of the PinQuest and how long it will run will depend upon how popular it is with guests. It’s extremely difficult to say as of today how long the activity will run (I wish that crystal ball was working :). As for future activities, I would invite you to keep watching DisneyParksBlog.com for additional updates. I will be going Aug 30-Sep 6… Do you think I will be able to complete the quest or will supplies be gone by the time I get there? @Madison – You should still be able to participate during that time. Hello! Is this something you can do in the evening? Or is this it only available daytime? I’m going Sept 19-26 will this still be going on? Hi Everyone! I did the full pinquest last night and wanted to update all those who are coming down soon. They didn’t seem to be running out of pins! I got all seven without any issues. And I only saw one other couple doing the quest. I don’t think too many people know about it because I had quite a few people ask me what I was doing throughout the night. So I think those of you traveling in September should be safe to complete the quest! Also, It was a very cute quest and the pins are very nice. Each clue has you do something quirky and silly to gain the pin, make sure you do this! It adds to the experience, and the cast members really enjoy it too. Quite a few times we got claps, compliments and thank you’s for giving it a real effort! Good Luck! Does anyone know if this is still going on. We will be there in mid October and would love to participate. My husband and I are going in October too and this looks fantastic! Will it still be going on? We live Disney pin trading!! Is this still available? I would love to go this week. Just wanted to let those interested that this is still available at Magic Kingdom. I did the pinquest on Nov. 4th and it seems like there were an alright amount still on the shelves. I assumed they’d be gone by now so wasn’t looking but suddenly saw the lanyard and was so excited! Keep an eye out!